1. HOW DOES SOLAR RADIATION AND OUT ATMOSPHERE BUILD A MODEL FOR CELLULAR UBIQUITIN MARKING? 2. HOW DOES GRAVITY AND LIGHT REACT HIGH ABOVE EARTH? 3. HOW DOES ENERGY FLOW BETWEEN THE SUN AND EARTH? 4. HOW DOES ENERGY FLOW IN CELLS? 5. HOW DOES SOLAR RADIATION POWER AND LINK UBIQUITIN RATES IN LIVING THINGS? In the last blog you saw how our living antenna is constructed. That antenna can fail many ways, but it can also stop working, if the environment it was designed to work within is seriously altered. Today’s world presents that kind of situation. Chemical and photonic evolution drive that process in our upper atmosphere. What reactions in the atmosphere drives that process? Changes in the direction of energy flows from the sun might be the answer. Our antenna was designed based upon the stable relationships of atoms and sunlight high above our heads in our atmosphere to deliver energy in stable flows. What happens when the flows are altered? How might this affect the antenna built into you? Will it receive and transmit signals properly? The direction of the sun’s light and what atoms these photons interact with is the critical first step in the ability for life to exist. This is where light first begins to interact with nitrogen and oxygen in our atmosphere. It forms the cornerstone photocatalytic reactions that set the stage for for light to help create life on Earth. The atmosphere of Earth is a layer of gases surrounding the planet Earth that is retained by Earth’s gravity. Gravity and light have many unique interactions that life uses to keep circadian timing accurate. Ubiquitination rates in cells rely deeply on these physical relationships. Ozone (O3) forms readily in the stratosphere as incoming ultraviolet radiation breaks molecular oxygen (two atoms) into atomic oxygen (a single atom). In that process, oxygen absorbs much of the ultraviolet radiation and prevents it from reaching the Earth’s surface where we live. The reason this occurs is because energy flows from the cathode rays of the sun to the anode’s in the Earth atmosphere. Cathode rays carry a positive charge and anodes are negatively charged. The difference in charges determines the way energy will flow in an ecosystem. The direction of energy flows is incredibly important on a planetary scale but also important on your inner mitochondrial membrane. Cathode and anode relationships also exist within the cells of all living things as well. This relationship exists between our skin and plasma and the sun as well. In our planetary system, the flow of energy is ultimately tied to the redox potential difference between sunlight and the atoms in atmosphere. High up in the atmosphere, there is oxygen and nitrogen with a lot of negative charge associated with these atoms because of all the electrons they contain. Electrons can be excited by the sun’s photons. When an electrically excited free oxygen atom encounters an oxygen molecule, they may bond to form ozone. Destruction of ozone in the stratosphere takes place as quickly as formation of ozone, because the chemical is so reactive. Sunlight can readily split ozone into an oxygen molecule and an individual oxygen atom. O3 + sunlight = O2 + O. This is the reversible coupled reaction that sunlight controls. Light controlling things (atoms or cells) is the consistent story found at many levels in this series. Many highly energetic reactions produce ozone, ranging from combustion to photocopying. Often laser printers will have a smell of ozone, which in high concentrations is toxic. Ozone is a powerful oxidizing agent readily reacting with other chemical compounds to make many possibly toxic oxides. Oxidizing agents cause loss of electrons thereby lowering the net negative charge. The ozone layer is contained within the stratosphere. In this layer ozone concentrations are about 2 to 8 parts per million, which is much higher than in the lower atmosphere but still very small compared to the main components of the atmosphere. It is mainly located in the lower portion of the stratosphere from about 9.3–21.7 miles; though the thickness varies seasonally and geographically. About 90% of the ozone in Earth’s atmosphere is contained in the stratosphere. These layers of the atmosphere act in very similar fashion as the skin on your body or the leaves on plants. They determine the power and direction of how energy flows from the sun to the Earth and living things below. The troposphere is located just beneath the stratosphere. The atomic interactions of what happens above the troposphere will determine energy flows from the sun to the troposphere and the Earth’s surface. The small amount of tropospheric ozone acts as a greenhouse gas and initiates the chemical removal of methane and other hydrocarbons from the atmosphere to maintain the net negative charge in the atmosphere where life can exist. In cells, maintenance of the net negative charge is also critical at the cell surface. Inflammation introduces a net positive charge and lowers the redox potential. This happens because inflammation has a low pH. Low pH = and excessive amount of protons and a relative lack of electrons. It turns out maintaining the charge in the atmosphere is also critically important to how sunlight can maintain photosynthetic capacity in plants and bacteria below. Photosynthesis forms the cornerstone of all the food webs on this planet, and it requires the atmosphere to maintain its overall net negative charge. Your mitochondria rely on your cells being able to maintain your net negative charge as well. EZ water has a net negative charge. Look at the picture below. What do these two proteins have in common? Both are capable of turning sunlight into a DC electric currents using a fortress of 4 atoms of nitrogen surrounding a metal. The difference between the two proteins is that hemoglobin needs an intermediate, (DHA) within the cell membrane of a RBC to make this transition happen properly. When it does the net negative charge of the plasma is increased. This action is called the zeta potential of blood plasma. The zeta potential is tied to how fast your blood can clot. DHA has a greater ability to give water in plasma (93%) and mitochondria reducing power to build complexity in cells. This is why mammals are more complex than plants, bacteria, and trees. Mammals use DHA and hemoglobin to link to water to transfer electrons to it. Plants, bacteria, and trees only need chlorophyll to transfer electrons to water. We can do the same thing in our retina ate the RPE. The RPE and chloroplasts are both hexagonal in shape and both show increasing circulation of their cellular contents to UV sunlight. Here you can see the atomic lattice of nitrogen around different metals. Nitrogen electrons are excited by sunlight and this energy is used by the metal inside to create electric currents from sunlight frequencies. Once again, it should become clear that solar radiations control the our cellular chemistry and our atmospheric chemistry on Earth to direct how carbon will be handled in all living things. People have lost this perspective on how primordial light’s relationship is to atmospheric atoms. 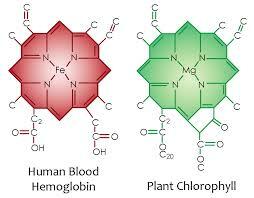 The very same relationship exists in hemoglobin and chlorophyll and our atmosphere. Nitrogen makes up 78% of the atmosphere. Oxygen makes up 21%. Thus, it turns out the concentration of these gases at different altitudes affects how long these compounds remain in the air to interact with sun light. Air content and atmospheric pressure vary at different layers of the atmosphere. The atmosphere becomes thinner and thinner with increasing altitude, with no definite boundary between the atmosphere and outer space. Here you can see why altitude and ubiquitin have the relationship they do. I covered this in ubiquitination 1. Air suitable for the survival of terrestrial plants and terrestrial animals is only found within Earth’s troposphere. With elevation above the troposphere, light has to, first, interact with oxygen and nitrogen to set the stage for life to innovate in layers below. Ozone is not normally found in the troposphere in any significant level. So what happens high up in the stratosphere with sunlight and oxygen? When solar radiations are able to electronically excite oxygen, and that atom encounters an ozone molecule, they may combine to form two molecules of oxygen. The ozone formation-destruction process in the stratosphere occurs rapidly and constantly, maintaining an ozone layer. In the troposphere near the Earth’s surface, ozone forms through the splitting of molecules by sunlight as it does in the stratosphere. However in the troposphere, nitrogen dioxide, not molecular oxygen, provides the primary source of the oxygen atoms required for ozone formation. Sunlight splits nitrogen dioxide into nitric oxide and an oxygen atom. A single oxygen atom then combines with an oxygen molecule to produce ozone. Ozone then reacts readily with nitric oxide to yield nitrogen dioxide and oxygen. The process described above results in no net gain in ozone. Concentrations occur in higher amounts in the troposphere than these reactions alone account for. In the 1950’s, chemists discovered that two additional chemical constitutents of the troposphere contribute to ozone formation. These constituents are nitrogen oxides and volatile organic compounds, and they have both natural and industrial sources. Nitrogen oxides (NOx): Nitric oxide and nitrogen dioxide are together known as NOx and often pronounced “nox.” Sources of NOx include lightning, chemical processes in soils, forest fires, and the intentional burning of vegetation to make way for new crops via biomass burning. NOx also come from smokestack and tailpipe emissions as by-products of the combustion of fossil fuels at high temperatures. Coal-fired power plants are believed to be the primary sources of NOx in the United States. Automobiles, diesel trucks and buses, and non-road engines used in farming and construction equipment, boats, and trains also produce NOx. This is why population density and ubiquitin marking rates are linked. Human pollution is capable of altering it by causing a pseudohypoxia. The oxygen atom formed in the second reaction then goes on to form ozone; this series of reactions is the main source of tropospheric ozone. CH3O2 is just one example of many partly oxidized organic molecules that can react with NO to form NO2. These reactions are rather fast so NO and NO2 tend to cycle, but the sum of their concentration of both [NO] + [NO2] tends to remain fairly constant. When these two chemical become uncoupled for any reason the flow of energy from the sun to the Earth is disturbed. The same effect can be seen in mitochondria when NAD+/NADH coupling is altered. Because of this atmospheric cycling, it is convenient to think of the two chemicals as a group; hence the term NOx. In addition to acting as a main precursor for tropospheric ozone, NOx is also harmful to human health in its own right. NOx may react with atmospheric water to make nitric acid, which may end up in the soil, where it makes nitrate, which is of use to growing plants. Excessive nitrates in an ecosystem which can cause explosive ubiquitin rates and growth in plants and bacteria. This will lead to lowered oxygen levels when this occurs. This is called pseudohypoxia. If this process is sustained long enough in an ecosystem anoxic conditions are possible. Things that use oxygen as their terminal electron acceptor will not tolerate this situation for long timescales. This is true in animals and humans. In plants and bacteria, nitrates can be uses as a terminal electron acceptor so they can generate energy this way. This is why the gut uses bacteria to transfer energy between themselves and humans are not affected by their abilities. This is why their is a delicate balance between our microbiome and our enterocytes in our gut. Humans are designed to use a different electron acceptor (oxygen), so this makes coupling the microbiome in our gut and our enterocytes perfect coupling elements that are capable of co-existing and co-evolution. The very same relationship is found in our atmosphere with the atomic interactions with sunlight and water. Rain-making bacteria have been discovered, and they are widely distributed in the atmosphere. Bacteria are capable of being found high up in our atmosphere where it is anoxic. They use nitrogen as their terminal electron acceptor. They do the same thing in our guts to control the flow of water. This is why there is a relationship between the Bristol stool chart and the type of microbiome one has. In the atmosphere, nitrogen oxide may refer to a binary compound of oxygen and nitrogen, or a mixture of such compounds: In atmospheric chemistry, air pollution, and related fields, nitrogen oxides refers specifically to NOx (NO and NO2). NO and NO2 are quite reactive but nevertheless quite stable when isolated. In the atmosphere, they are isolated and therefore stable. The bacteria in our atmosphere however are capable of interacting with NOx and water to rain down on life. This relationship today, is in flux because of modern life. Certain diseases like Kawasaki disease is dramatically altered by these relationships. These changes can lead to marked increases in ubiquitin rates in cells that can occur rapidly in less than 24 hours. NOx often appears as a brownish gas in the dawn and at sunset. Most of us have experienced this. It is a strong oxidizing agent and plays a major role in the atmospheric reactions with volatile organic compounds (VOC) that produce ozone (smog) on hot summer days. Los Angeles and Shanghai have massive NOx and VOC interactions compared to other cities because of modern changes. Here again you can see why areas with population density and high levels of VOC’s are linked to ubiquitin marking rates of proteins. Volatile organic compounds (VOCs) such as hydrocarbons. “Volatile” refers to an extreme readiness to vaporize. Some plants and bacterial processes in soils emit VOC’s. The smell of a pine forest comes from a hydrocarbon called alpha-pinene. VOC’s also come from gasoline combustion and from the evaporation of liquid fuels, solvents and organic chemicals, such as those in some paints, cleaners, barbecue starter, and nail polish remover. All of these are more prominent where populations reside. The formula above represents several series of reactions that do not lend themselves to simple depiction. They involve the oxidation of VOC’s in reactions that also involve NOx. Hydroxyl catalyzes some of the key reactions, and dozens of other chemical species take part. The result is ozone, nitrogen dioxide (available for more ozone formation), the regeneration of hydroxyl (available to catalyze more ozone formation), and some other chemical species. The specific ratio of NOx to VOC determines the efficiency of the ozone formation process. The efficiency of ozone formation rises and then falls as the ratio of nitrogen oxides (NOx) to volatile organic compounds (VOCs) increases in an idealized plot. Higher NOx emissions result in less efficient ozone production. Lower ozone production allows more powerful UV light to increase ubiquitin rates of living things below. The modeler who made this plot intentionally left off all units of measurement, because the ratio itself is more important than the specific concentrations of the compounds. Authorities who want to control ozone production must take the ratio into account. Livestock such as cattle and hogs emit significant amounts of methane, one of the chemicals involved in ozone production. One cow produces an average of 0.23 kg (0.5 lb) of methane per day. Earth’s total population of 1.4 billion cows produce 700 million kg (317 million pounds) of methane per day. Termite mounds and rice paddies are also significant producers of methane. Ozone formation with the hydrocarbon methane provides a useful example of the general pattern that most such reactions follow. The methane example is somewhat simpler and easier to follow than the others, described in steps. Most ozone formations in the troposphere involve non-methane hydrocarbons. The chemistry of ozone formation from non-methane hydrocarbons follows the general pattern described above but is much more complex. NOx and VOC’s together include about 120 different chemical compounds, and hundreds of chemical reactions can take place. These are new emergent chemicals that drive new photo-chemical evolution in the atmosphere. These emergent photo-chemicals are capable of causing more rapid evolution of life below by increasing ubiquitination rates of bacteria, viri, and cells. Remember ubiquitin controls how carbon can flow in living things. Some of the participating chemicals may be intercepted part of the way through the process by reactions with other chemicals in the atmosphere, and may form intermediate compounds that act as temporary reservoirs for varying amounts of time. Swirling cloud masses over the Tasman Sea between Australia and New Zealand illustrate the fluidity of our dynamic atmosphere. The magnetosphere is the first major filter of solar radiations that block out the highest energy non native solar radiations to protect life. Clouds and weather only exist within the troposphere below the levels where ozone and UV light interacts to be the second major filter of solar radiations. The higher the radiative power is, the higher ubiquitin rates will be in levels below. This relationship is critical in the atmosphere, in your skin, and on the surface of this planet. The higher the rates are the more erratic carbon will flow in living cells. Without these protective “onion layers” life would not be possible below. When these quantum processes are altered, life becomes altered. This is why flying or living at high altitudes are also dangerous. Altitude alone, allows for higher ubiquitination rates in cells. It also cause a loss of zeta potential to cause blood to clot faster. It can also alter how a mammals hair will grow when it is forced to stay at a high altitude. The same relationship of elevated ubiquitin rates is built into the Earth atmosphere and our skin and plasma, as I discussed saw in Tensegrity 7. Winds and weather conditions such as air temperature and humidity influence ozone chemistry in the atmosphere. Ozone directly affects light to effect the growing rates of things below. This is why the donut hole in the southern hemisphere has been associated with higher ubiqutination rates in Australia and in New Zealand. It also explains why they have seen explosive rates of neolithic diseases begin in the 20th century. An additional challenge arising for anyone tracking tropospheric ozone-forming reactions is that they entail interactions between different phases of matter (gas, liquid, and particles known as aerosols), and can occur on various kinds of aerosol surfaces in the atmosphere. Many of the chemicals involved have very short lifetimes before they react with other chemicals to form new compounds. This speeds chemical photo-evolution. Modern scientists face myriad challenges in their pursuit of understanding tropospheric ozone chemistry as solar radiation enter and remain in our atmosphere on different timescales. Changing environmental conditions in the Earth’s ecosystem, such as air temperature and humidity also greatly effect ozone chemistry. CO2, greenhouse gases, and non native EMF all greatly effect these atomic interactions with sunlight. This, in turn, increases ubiquitin marking in proteins of living things below on the Earth’s surface, causing many new emergent diseases and changes to manifest. What happens in the atmosphere is a model for what is happening on Earth today. It is time we see that homology in us causing today’s problems. Fishman, Jack, et al., NASA Langley Research Center, Hampton, VA. 1999. Surface Ozone Measurements: Exciting Science for All Seasons All the Time.